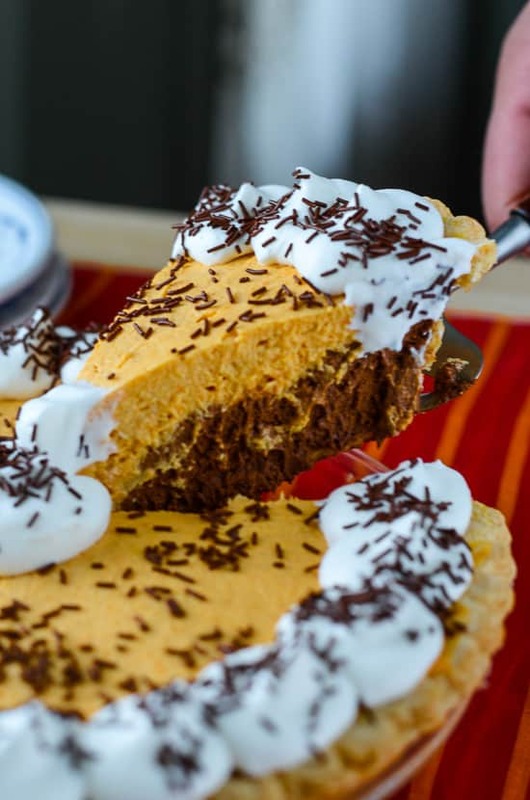 Find a new holiday classic in this smooth and creamy Chocolate Pumpkin French Silk Pie – a French Silk pie base topped with pumpkin pie mousse and nestled in a cinnamon pecan crust. Hey, taste buds – fall is here! I am so ready for fall to get here. I’m ready for sweaters and hot cocoa and jeans. For apple cider and my fuzzy boots and cinnamon-scented everything. For the county fair and candy corn and cool air with no humidity and pumpkin patches and hayrides. The list is exhaustive, I promise, so. I’ll stop here…but I can email you a copy if you’d like (haha)! 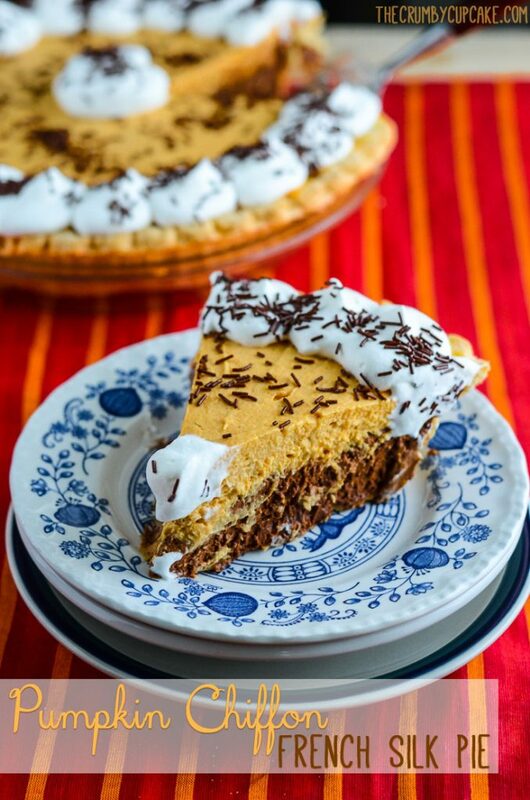 As for this Chocolate Pumpkin French Silk Pie. I was so ready for it that I’ve made it twice. In the last week. 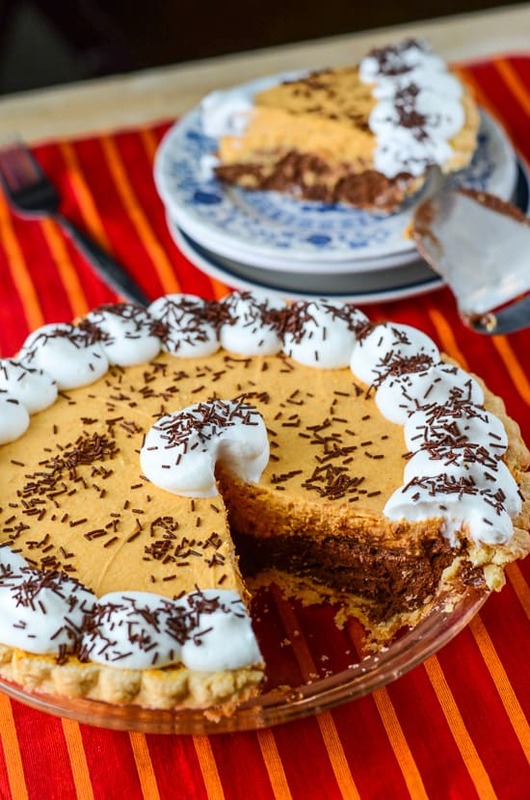 JUST TAKE ME TO THE CHOCOLATE PUMPKIN FRENCH SILK PIE ALREADY! If you’d rather skip my (pretty darn helpful) tips and tricks, essential cooking info, and similar recipe ideas – and get straight to this deliciously easy French silk pie recipe, just scroll right on down to the bottom of the page where you can find the printable recipe card! With all this talk of fall weather, we actually only get a few nice months of weather before it’s back to the humid, sticky, mosquito-filled days that we spend so much time of the year living through. I am clearly living in the wrong state. I was meant for scarves and snow days. Alas, I grew up here, so it’s truly all I’ve ever known, and it’s hard to just pick up 30 years of your life and move away from your friends and family to somewhere strange where you don’t know a soul. Mr. Crumby and I have wrestled with the idea of moving further north quite a bit in the past couple of years. He has family in Pennsylvania and New England, as do I, but my only close family is a 10 minute drive from where we currently live. A house that I’ve lived in for pretty much my entire life. I was blessed to have a wonderful Nana who raised me and sacrificed all she had to help me become the person I am today. I mean, she provided a happy, healthy life for her great-granddaughter on a retired widow’s Social Security check and a wallet full of credit cards, and I don’t recall her ever having any complaints about it. This woman loved me so much, she left every possession she had to me when she passed away in 2005 at age 90, including the house she raised me in. I’m sure that when we meet again, I’ll never have enough words to be able to thank her for everything she did for me. It’s taken years for me to fully realize and appreciate the effect she had on my life, and I thank God every single day that I got to have her with me for as long as I did. Just so you know, for all you ladies (and gentlemen, also) out there raising a grandchild or a great-grandchild or a niece or nephew, even a foster child – no matter how unappreciated you feel sometimes, know that what you’re doing is wonderful. Children from broken homes feel so confused and unwanted when they don’t have a mommy and daddy to have dinner with every night, and go to Disney World with, and to read them bedtime stories and share their ice cream with them. But the fact that they have you there, teaching them and guiding them and loving them…you’re not simply filling in for those absent parents, you’re filling the holes in their hearts. For me, Nana was my mom and dad, but she was so much more than that, and so are you. So, thank you. Trust me, I speak for every child when I say that. Enough sap. Time for pie. It looks unassuming on the outside. 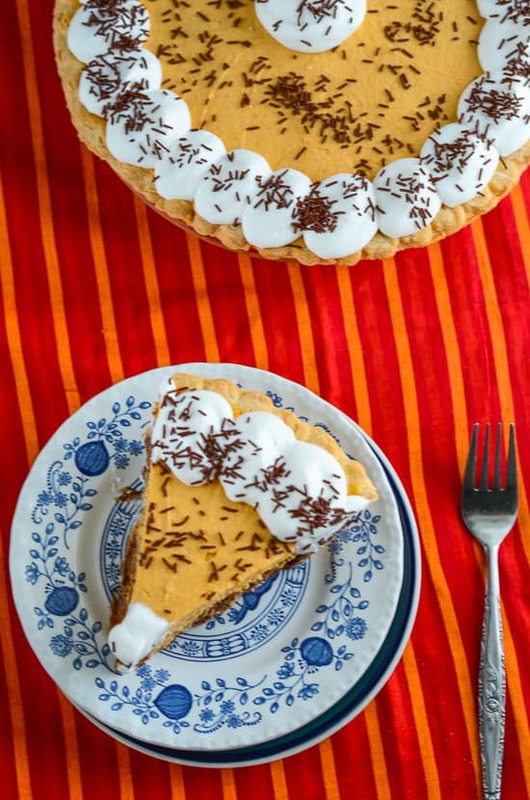 Almost like an ordinary pumpkin pie, a little fancied up with some chocolate jimmies and whipped cream. Without cutting into it, you’d never know about the beautiful secret second layer. Isn’t it calling your name?! All glisten-y in the sunlight. I could literally just eat it with a spoon. It’s so wonderfully silky and smooth. And don’t even get me started on the Pumpkin Chiffon part. It’s all things fall and cream cheese and cinnamon and yum. The first bite I took of this pie was quite an experience, as I’d never made anything like it before. I wasn’t sure what to expect. The first thing you taste is the pumpkin. It’s velvety and spicy and reminiscent of Thanksgiving at grandmas, which is never a bad thing. As you contemplate the pumpkin, BAM CHOCOLATE. And then the cinnamon pecan crust makes life make sense. 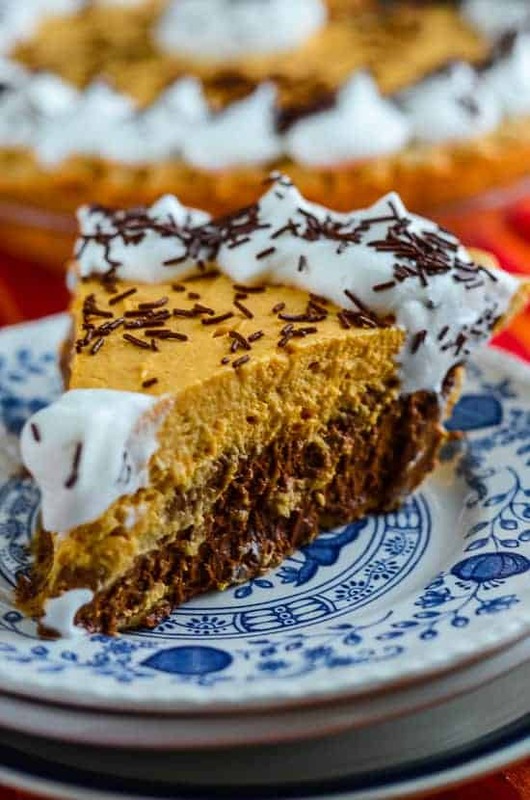 Note: Raw eggs are used in this Chocolate Pumpkin French Silk Pie; they should not be used in food prepared for pregnant women, babies, young children, or anyone whose health is compromised. 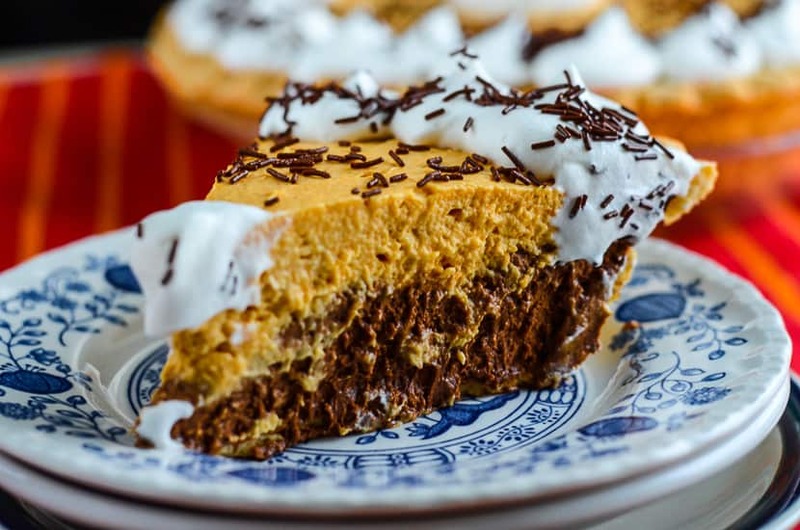 Find a new holiday classic in this smooth and creamy Chocolate Pumpkin French Silk Pie - a French Silk pie base topped with pumpkin pie mousse and nestled in a cinnamon pecan crust. Hey, taste buds – fall is here! In a medium mixing bowl, combine crust ingredients. Use a pastry cutter or your fingers to massage them together until coarse crumbs form. Alternatively, you can pulse them together in a food processor. Bake for 20-25 minutes or until crust is golden brown; cool. In a stand mixer fitted with a paddle attachment, beat butter and sugar until light and fluffy. With the mixer running, pour cooled melted chocolate into the fluffy butter sugar mixture. Add vanilla and cocoa powder and mix until incorporated; scrape sides of bowl as necessary. Add eggs one at a time, beating at medium-high speed for a full 5 minutes between each egg - use the pouring shield! It will get messy! Pour filling into cooled pie crust and place in refrigerator, chilling until set, about 2 hours. In a clean stand mixer bowl fitted with paddle, beat cream cheese until softened. Add pudding mix, pumpkin puree, cinnamon, and spice and mix until well blended. Fold in whipped cream carefully with a spatula until mixture is incorporated and fluffy. 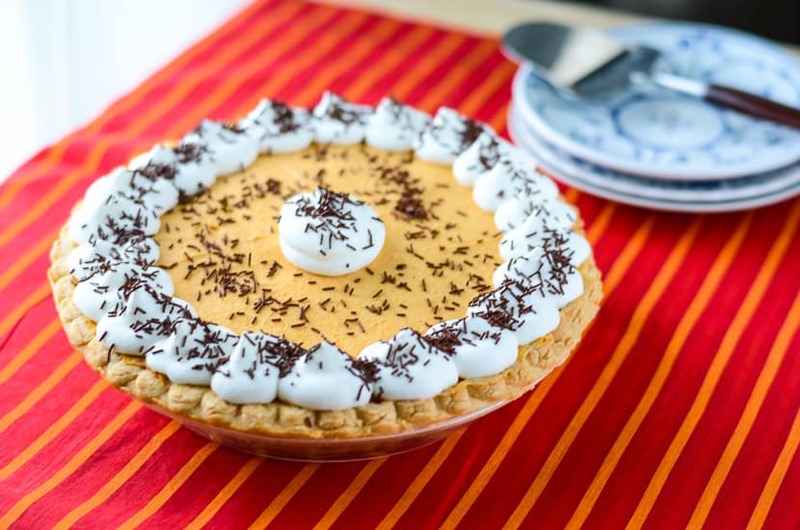 Remove pie from fridge and spoon pumpkin layer on top of chocolate layer, carefully spreading to cover the pie. Cover with plastic wrap and refrigerate pie for at least 4 hours to set, and up to 2 days before serving. When ready to serve, decorate with whipped cream and chocolate curls or sprinkles. 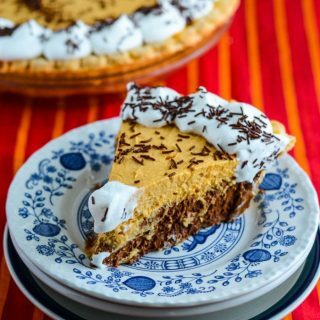 Note: Raw eggs are used in this Pumpkin Chiffon French Silk Pie; they should not be used in food prepared for pregnant women, babies, young children, or anyone whose health is compromised. Beautiful Pie! I’ve never made a french silk pie, but I think I may now. I love the twist you did on this! Thank you, Miranda! I had never made one either, and the idea of and unbaked pie with raw eggs kind of threw me, but it’s so delicious that it’s worth it! And, as long as you refrigerate the eggs and wash them well before you crack them, you should be fine! I hear you on the no-fall/ mosquitos/ humidity–Charleston doesn’t have a spring or a fall! That won’t stop me from trying this pie, as I have been dreaming about eating pie for days now (you’ve totally read my mind). Pinned! Oh my, that means I’d have to move even further north than SC?! Goodness, I can’t win! 🙂 I really hope you enjoy the pie! Please stop by and tell me how it turns out! Oh yeah, I feel ya on the shorts for Christmas thing. At least we can turn the AC down really low, snuggle up in our PJs, and -pretend-it’s cold out!! Oh my goodness, girl. I’m so ready for fall, too, and it could not come sooner in North Texas. Sure, we got a hint of it a few weeks ago, but I’m ready for the weather to be cooler for good. And then this pie. DROOL. Seriously. This sounds amazing! And I’m one of the folks who moved away from everyone she knew and loved. First to college, then to Texas with my husband. I never imagined myself being where I am today, but we are both unbelievably happy at where we live and the people we are surrounded with, even though our families are hours away. I passed up an opportunity to attend college away from the area and chose to study closer to home to take care of Nana. I don’t regret it for a second, because I love the life I have, but I can’t help but wonder where I’d be if I had gone. I’m glad you found joy where you are, though! I think it’s amazing you passed on the opportunity to go to college away from home to take care of your Nana. That’s amazing, girl, and it sounds like you’ve found exactly where you need to be. 🙂 Sometimes, you don’t have to travel at all to find a home! I promise you had my tastebuds watering with the name of this alone. This look absolutely indulgent and amazing! Thanks, Mrs. Tee! I just ate the last slice, and I so wish I could forward you guys the flavor right to your inbox! I LOVE that you added chocolate to this. I can’t think of anything better. This looks absolutely divine! Truth be told, I was a little wary of mixing the two, but then I thought back to the pumpkin mocha coffee I love from Dunkin Donuts and it made it seem so right! Thanks, Jess! Looks amazing! Now that the weather is starting to cool in Texas I am ready to bring on all things pumpkin! Yum! Pumpkin is everywhere right now! I almost feel like I’m a little late to the party! Thank you! This looks sooooo yummy!! Thank you for sharing. I’m pinning for later. You are absolutely welcome, and thank you!! Ok. I’m totally drooling now.. but I just need to find a way to make this dairy free.. lol. Oh gosh! That’s quite a dilemma! I’m not sure coconut oil would hold up! I’d love to! Especially to help celebrate you blogiversary!!! Congratulations!! Oooh, what are you doing with your kitchen?! I just LOVE your photos. There is something so decadent about this dessert! Thank you, Krystal! 😀 It is seriously intense! Oh. My. Lawd. I want this pie now. I wish I could send one over to you! OMG! My mouth is watering! This looks AMAZING. This seriously looks amazing! 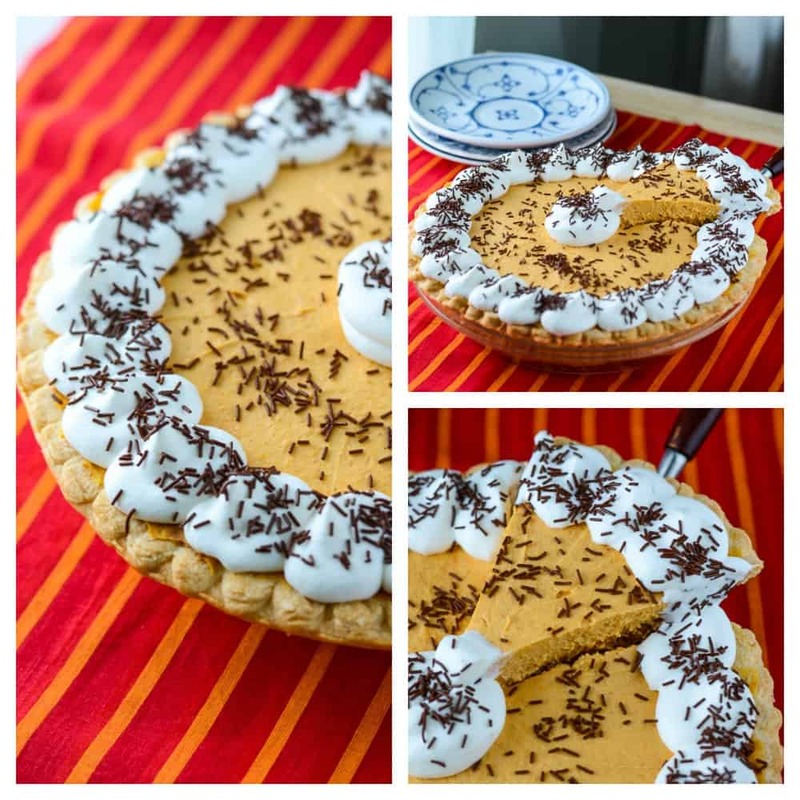 I love pumpkin and have been wanting to try combining it with chocolate. I’d be happy to linkup!! Thank you for the invitation!! Thank you, Sarah!! Try it! Your pie looks fabulous! I would be honored if you would stop by and share this recipe at Foodie Fridays this week. The party is going on now until Sunday evening. Hope to see you there. I love this!! 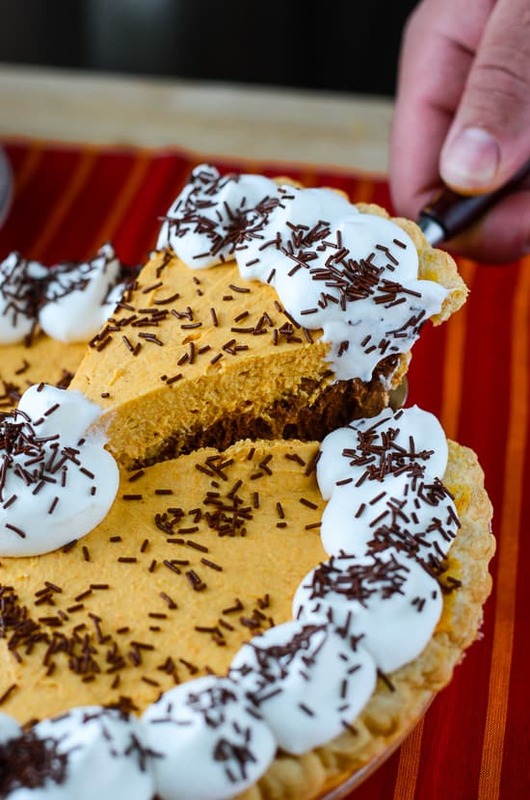 Gorgeous, and I love the combo of pumpkin and chocolate!! Thank you, Dorothy!! I’m starting to think chocolate pairs well with a lot of things you wouldn’t expect. More experimentation necessary, haha!!! This looks delicious, lovely recipe! Your blog is super impressive considering how new it is, well done but slightly daunting to another newbie blogger haha! Thank you so much, Teri! I really appreciate the compliment – I have and continue to work really hard to make this blog look good! I did a ton of research before launching, and had some site building knowledge beforehand, which helped a lot. Believe me, I second guess myself quite often. Don’t feel daunted! Your blog is absolutely adorable! I can’t wait to see what else you make in your kitchen. 🙂 I followed you all over! Your Nana sounds wonderful! What a blessing to have had her! I live completely on the other side of the country from where I grew up and this is home now. I’ve been here for 23 years. Your pie looks amazing! I am very late visiting from last week’s Foodie Fridays, but I wanted to stop by! Thank you for linking this yummy dessert up with us! Thank you so much for stopping by! She was the most wonderful lady, and I’m sure if she were here, she’d be telling me to get over my fear, and move wherever I wanted to. She was pretty blunt, LOL. Experiment away with results like this! I’m surprising B.D.Girl with this in 12 days. Thank you for sharing. I hope you enjoy it!! Let me know how it turns out! Lovely pie. Looks very special and delicious for any occasion. Oh my goodness this looks heavenly! I’m bookmarking this to make for Thanksgiving this year! Love this! I was just wondering why is there a two day wait time before serving? Can it be served earlier than two days? You can absolutely serve it the same day! It needs a minimum of 4 hours to set properly before serving – the 2 days is how far ahead you can prepare it before you eat it! Made this about two weeks ago and was instantly asking this question: am I supposed to add water to these crust ingredients? I did not, and therefore could not build up the outer, top edge of the crust like the one in your pictures. Subsequently, I felt as though the crust ended up far too thick because the dough that would have gone around the upper part of the pie plate had to go into the bowl of the pie plate. It still tasted great, but to reiterate my question: was there supposed to be liquid added to the crust ingredients, like every other crust I’ve ever made? If not, how on earth did you get your crust to look like it does in your photos? Thanks. So it just says 1/2 package of pudding, but I’d like to know what size the package of pudding you used is as they vary. Thanks!